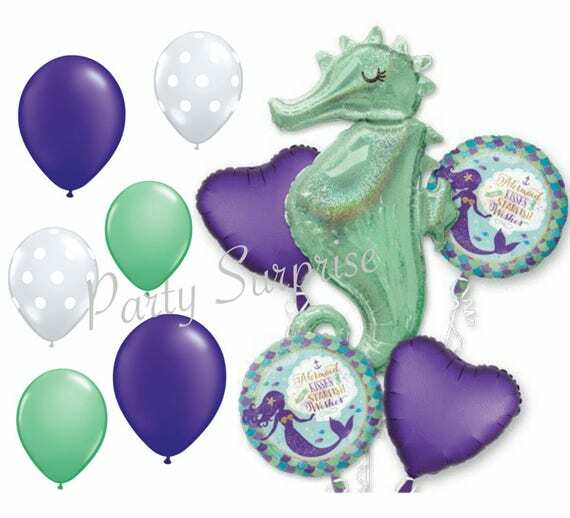 Simply gorgeous Seahorse and Mermaid balloon package! * 1 Holographic Seahorse mylar foil, inflate with helium or air** to 20"x38"
* 2 Holographic Mermaids wishes round mylar foil, inflate with helium or air** to 18", photo 3 above. * 2 Purple mylar foil hearts, inflate with helium or air** to 17", photo 1 above. * Clear with white polka dots, latex, inflate with air or helium to 11"
* Winter Green latex, inflate with air or helium to 11"
* Pearl purple quartz latex, inflate with air or helium to 16"
**REUSABLE!! Please note - if you don't need the mylar balloons to float and are fine with air-filled, you can inflate the mylar foil with a straw. If the balloon is kept in good condition, insert the straw again, and gently remove the air, then fold the balloon and use for your next party! Select your package from the DROP DOWNS in the ORDER box. Scroll down here for package details. Ordering other items? Your orders will be combined for shipping to the same address and shipping will be adjusted accordingly. 12 clear polka dot latex 11"
18 winter green latex 11"
8 pearl purple quartz latex 16"
10 clear polka dot latex 11"
12 winter green latex 11"
7 pearl purple quartz latex 16"
6 clear polka dot latex 11"
3 pearl purple quartz latex 16"
Don't forget your balloons, balloon arch/garland kits, photo prop sets, fancy straws, tableware sets, mini popcorn boxes, Euro gift bags, gift/favor/treat bags, tissue tassel garlands & balloon tails, custom wedding confetti wands, party tableware, disposable cutlery, cake toppers, and cupcake toppers & wrappers - I have what you want! Ordering other items? Your orders will be combined for shipping to the same address, and shipping cost will be adjusted accordingly. Do not leave with children who are unattended due to choking and suffocation hazard. The term 'Etsy' is a trademark of Etsy, Inc. This application uses the Etsy API but is not endorsed or certified by Etsy, Inc.
Are you a party professional? Create your free vendor listing!